Pascale Marthine Tayou: Boomerang. Installation View, Serpentine Sackler Gallery. 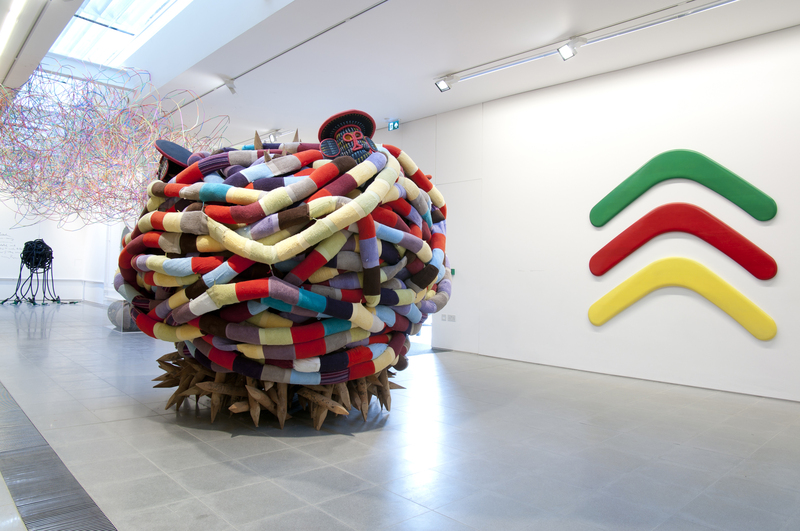 I have to confess to a sense of confusion at the outset in sitting down to write a review of Pascale Marthine Tayou’s exhibition ‘Boomerang,’ now showing at Serpentine Sackler Gallery in London. Comprising new works created especially for this show alongside several older pieces, the exhibition is the self-taught artist’s first showing in the UK since 2008, and evidences a dynamic cross-section of influences between his native Cameroon and his adopted home in Belgium. Here then perhaps comes the difficulty. On the one hand there is an engaging series of texts which accompany the press kit, alongside a collection of images of Tayou’s impactful work. On the other is the completely overwhelming experience of walking through the Sackler Gallery, occasionally sidestepping pieces of art and trying to look in ten directions at once. What emerged from the conversation I had with my colleague after we exited the gallery was not so much a dissection of Tayou’s work as an overriding frustration at not being able to access it. Much of the writing about the exhibition emphasises the political concerns of the work, and the way the artist engages with social, ecological and economic tensions in his sculptures and installations. The materials he uses include elements that highlight pollution and consumption, as well as the skewered power structures between those in charge of large multi-national companies and those who perform much of the labour involved in the production of basic goods. Written on the walls of the space in between some of the works are references to some of the most polluted spaces in the world, including the nuclear disaster at Chernobyl. It should be noted that even amongst the sense of confusion, several works immediately stood out. Octopus (2010) is easily one of the most memorable pieces; a giant ball of petrol tubes resembling its namesake, made all the more pointed by the pump handles which effectively constitute the creature’s feet. Images of the Deepwater Horizon spill in the Gulf of Mexico in 2010 come to mind, emphasised in no small way by the BP Green colouring of the handles, but undermined somewhat by the bright lighting of the space and the way other works near the corner crowd the sculpture. Two other works which stand out are Coton Tige (Cotton Stick) (2015) and Our Traditions (2015). The first is a large mass of wooden stakes, chicken wire, fabric and cotton wool, which hovers over the space, wooden points somewhat ominously hanging just over head. The work has an almost comical connotation, like an old cartoon punch-up drawn as a ball of dust, with the occasional limb or extremity rising above the ruckus for a moment before disappearing back into the midst of the fray. It shares the deceptively simplistic force of Octopus, while also highlighting Europe’s history of slavery, associated with the picking of cotton. The implicit violence of the cloud seems less comical as this haunting legacy of slave labour and third world exploitation comes clearer into focus. Our Traditions (2015) features a number of items altered by the artist hanging from a similarly large and imposing mass in the matching central gallery space. Among these objects is a series of masks, traditionally carved in wood, here rendered in crystal. There are hints here of the diamond trade, and the further manipulation of regions in Africa by Western colonial powers. The title of the work also suggests appropriation and exploitation, a gross colonial crime which has many faces, some of which are represented here. These two installations are also responses of sorts to the gallery’s original purpose when built in 1805… as an armoury; violence, conquest and empire, the building blocks of British society simultaneously cast as the wrecking ball of the poorer regions of the world. What is frustrating then is how works like these and others are often obscured not by any conceptual intervention on the part of a curator or artist, but simply by each other. As you walk into the gallery, four huge sculptures greet you from the outset. When you begin to walk around the gallery loop, you find yourself side-stepping works, catching glimpses of pieces or materials here and there while almost constantly being drawn to another structure or object at the same time. 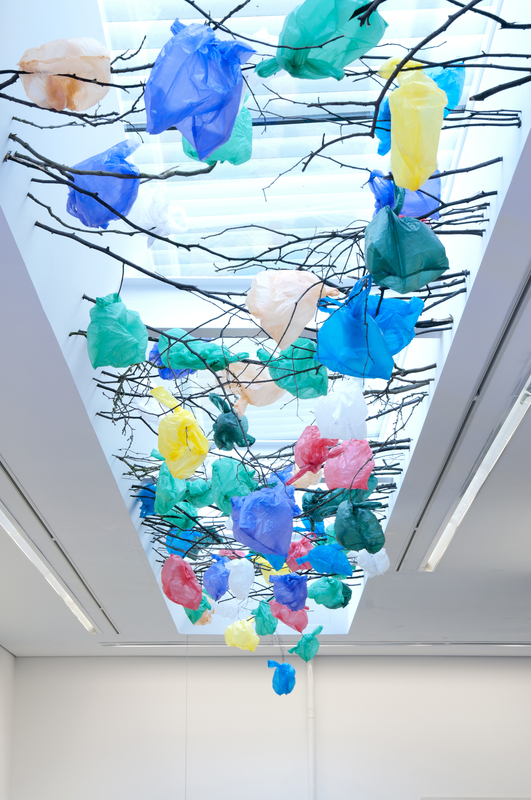 Glancing overhead, you catch sight of Plastic Tree (2015), a mesh of branches and plastic bags that looks stunning in the exhibition catalogue when photographed on its own, but here seems almost like an afterthought within the mass of other works. There’s the uncomfortable feeling that the space was approached almost as a challenge, and the resulting response to use every available nook and cranny serves only to obscure the work and the message, rather than show it on its strongest footing. There is no doubt that there is some fantastic work within this exhibition, but even those who approach it with such optimism in mind may still find themselves leaving somewhat dissatisfied with the experience.